Consulting children in the early years. Talking Mats is fun! 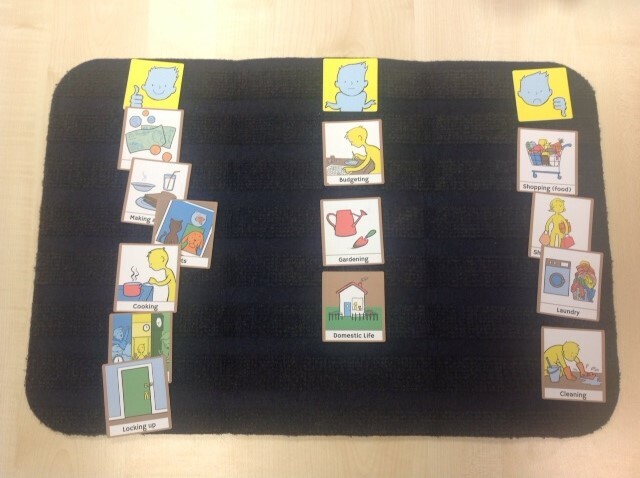 Whether you are sitting on the floor completing your mat or sitting at a small table, young children enjoy the fact that they can give information through multiple channels – Talking Mats is visual, auditory and tactile. 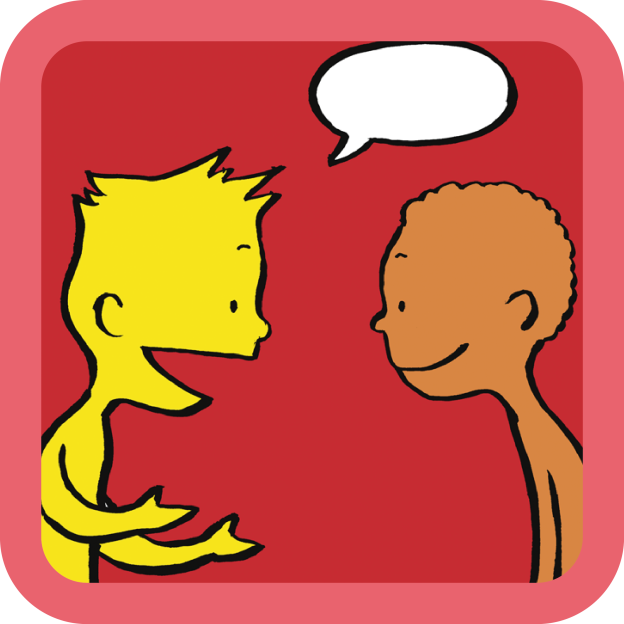 It is an engaging tool to use when consulting children.They can express a view without words if they want to or they can have a conversation if they enjoy chatting. Watching a young child thinking and reflecting about where they place their symbol on the mat can be a humbling experience. Some adults still consider young children as incapable of expressing their views or opinions but in reality they can often express strong views about things and are very capable of grading their responses. Sometimes we just don’t take the time to ask them about the issues in their lives and free up some time to listen. We have found that it is best to allow the child to interpret the meaning at their level so it maybe they have sore eyes; they don’t like their glasses or they have brown eyes. Try not to be too prescriptive when presenting the option to the child; a symbol can act as a jump off point capturing what fits for the child at the time. Just allow the meaning to emerge. • The abstract symbols do need a bit more explanation because they ask about more complex concepts such as safety. The Early years pack asks about safety in relation to the road, physical safety and safety around others. Asking about daily routines will give insight into how nurtured and cared for they feel. Let the child lead the discussion as much as possible. Using visual communication is a great way to have a conversation with children in the early years and a good tool to involve children in decision making. Listening to the child’s view is essential for the GIRFEC process in Scotland and for co-producing Education Health care plans in England and Wales. Talking Mats has created a unique resource which is based on the “International Classification of Functioning, Disability and Health – Children and Youth version” Talking Mats uses a framework which helps children to express themselves in a way they feel comfortable with. As adults we need to be able to facilitate the conversation. 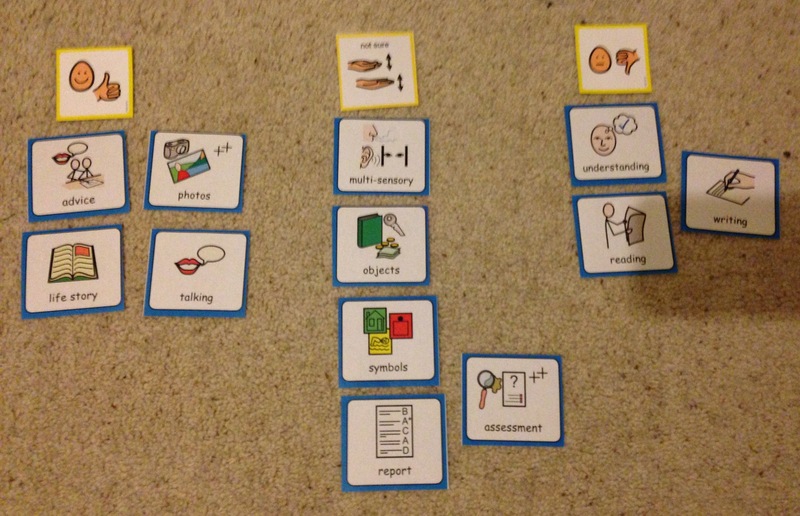 This entry was posted in AAC, Blog, Children and young people, Communication difficulties, GIRFEC, Participation, Talking Mats principles and tagged AAC, Children, Communication difficulties, GIRFEC, Participation, Talking Mats, Young people on April 28, 2014 by Margo Mackay. Can Talking Mats be used with someone who is blind? When Ian asked me to explain Talking Mats I guided his hand to the positioning of the 3 top scale symbols and then he immediately understood the layout of the top scale, the topic at the bottom of the mat, and where to place each option by touch. I simply explained each symbol, placed it in his hand and he did the rest. The topic was how Ian feels about Domestic Life and we had a lot of laughs about his dislike of shopping, laundry and cleaning. 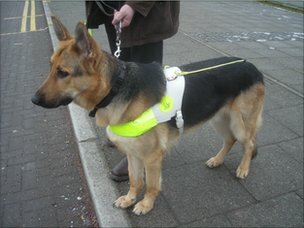 He explained that shopping was a nightmare for someone who is blind. He said that the dislike of laundry and cleaning showed that he was lazy – I think it’s pretty much what lots of people think! However he was clear about a number of things that he feels very positive about, in particular his daily routine and his security, both of which are very important because of his blindness. Interestingly he said that his guide dog is clearly on the positive side of the mat, but not as a pet. A dog like Renton is not just a form of mobility, he’s also a fantastic companion. Ian seemed to keep 1 step ahead of me and asked loads of great questions about Talking Mats as a thinking tool and its possibilities for other groups of people. He commented that, like inventions such as the typewriter and the phone, Talking mats is something originally intended for people with a disability, but which is now being used by people of all abilities to help them consider issues and then express their views. Ian generously agreed to me writing this blog and using his photo. Hope he doesn’t mind me including a picture of Renton. This is also a first for me as I’m really scared of dogs – especially enormous shaggy German Shepherds!! 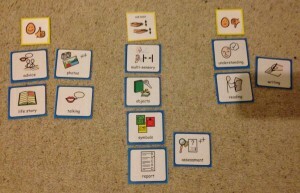 This entry was posted in Blindness, Blog and tagged AAC, Participation, Talking Mats on April 23, 2014 by Joan Murphy. may tend to digress and repeat themselves. may be difficult to understand. The DCDS requires a third party who knows the person with dementia well (a paid carer or family member) to assess various aspects of their communication on a 5-option scale. People are asked to circle the option that most closely describes the person in question. Each DCDS option is assigned a score: for example ‘Never’ = 0, ‘Sometimes’ = 1, ‘Often’ = 2, ‘Always’ or ‘Says too little for me to judge’ = 3. A person’s DCDS rating is obtained by totalling their scores for all 13 statements. DCDS ratings can therefore range from 0-39, with a higher rating indicating a greater degree of communication difficulty. • DCDS rating between 20 and 39= late stage. The Dementia Communication Difficulties Scale is brief, straightforward and quick to complete, and may therefore provide a highly useful tool for the care staff, clinicians and practitioners involved in assessing the needs of people with dementia. Kempler, D. (1995). Language Changes in Dementia of the Alzheimer Type. In R. Lubinski (Ed. ), Dementia and Communication, San Diego: Singular Publishing Group. Health Education Board for Scotland (1996). Coping with Dementia: A Handbook for Carers. HEBS. This entry was posted in Blog, Capacity, Communication difficulties, Dementia, Research and tagged Communication difficulties, Dementia, Research on April 22, 2014 by Joan Murphy. Tony was referred to me for Speech and Language Therapy around 6 months after being diagnosed with mixed dementia. Dementia was having many effects on him but a key impact was communication difficulties: one of these difficulties was dysarthria (for him, this meant slow, slurred, effortful speech and difficulty maintaining enough breath support to finish his sentences) and another word-finding problems (difficulty remembering and producing the words he wanted to say – like the “tip of your tongue” phenomenon we all get from time to time, but occurring in most of Tony’s sentences). These two communication difficulties combined made talking very tiring and frustrating for him. Mat 2: “My worries”. Tony used a three point scale to indicate whether he was “not worried”, “a bit worried” or “very worried” about a range of aspects of his life and future. We found that Tony’s main worry was what he would do with his time as his dementia progressed. Mat 3: “Activities with dementia” – a sub-mat based on Tony’s main worry identified in Mat 2. This was done jointly with his advisor, Sabira, from his local dementia support service, who planned the mat with me to ensure it covered all the options Tony had available to him locally. The mat revealed that Tony was already attending a well-being café but wanted to try other well-being cafes too, to meet more people. He was keen to try the singing group and also felt that his family needed support. Sabira commented that she thought Talking Mats should be used more with people with dementia and she intended to explore this within her own service. Mat 4: “What I want help with from Speech and Language Therapy”. Again we used a three point scale, this time to indicate “yes”, “no” and “maybe” to possible goals for Tony. Options included assessment, therapy and advice. We chatted around each topic, giving Tony more information on each possibility and discussing if and how it could benefit him. Tony made informed choices around each option, and made the decision to start by creating a Life Story. With Talking Mats, Tony has been able to give his full views on some very difficult topics for him. He has done so in a way which has reduced the demand on his speech, which made the discussion easier and less tiring for him. He has taken control of his Speech and Language Therapy care and has made informed decisions about his therapy goals. Perhaps more importantly he has taken control of his future and made informed choices about what he wants for himself and his family for the rest of his life. Talking Mats could be used by many services for people with dementia. Imagine how empowered people with dementia would be, for example, if their social worker or dementia adviser were able to use Talking Mats with them to identify their needs and wishes and help them choose what they want for their present and future. What better way to involve people in their own care? The only caveat? Get in there early. Empower people to tell their story while they are still able to use pictures and words to do so. Dementia can steal these skills, burdening families with making decisions on behalf of their loved ones. As a daughter, mother, wife and sister myself, I know I would feel much more at ease with making a decision for my relative with prior knowledge of what they themselves would have wanted. Talking Mats is one way of finding that out. This entry was posted in Dementia, Learning disability, Personalisation and tagged Communication difficulties, Dementia, goal setting, Learning Disability, Personalisation on April 15, 2014 by Guest Blogger. How can you help someone express how they feel about their communication using the health and well-being resource? I then explored how Kate felt about understanding what people were saying to her. Kate was able to tell me that she found it easier to understand people on a one to one basis rather than in a group setting. She indicated that it really helped her if people used gestures or wrote things down. Her main difficulty was understanding people on the phone, and in fact she had stopped answering the phone altogether (see mat below). We went on to do a mat about Kate’s learning and thinking. In this set, there are symbols which cover higher level language activities such as reading, problem solving and organisation. When we talked about these areas, Kate was able to tell me about the things she was finding most problematic, but could also identify some things that she felt she could still manage (such as calculations and reading newspapers). I then asked Kate how she felt about communicating with different people in her life. This mat shows that Kate found talking to her husband and her parents (who lived quite far away) particularly difficult. 1. Kate felt that her husband needed support and information, so we spent time working with him, showing him the best ways to support Kate’s communication. 2. Because Kate’s parents lived quite far away, she could only contact them using the phone, which was very difficult. We worked on getting Skype set up so that Kate could communicate with her family using all the modes available to her. By splitting communication into different sub mats, Kate was able to think about different aspects of her communication and identify the things that she found most challenging. Together we began to work out some ways to help her overcome her difficulties. Use the communication symbols to find out what people want to work on and use a collaborative approach to establish some goals to work on in therapy. I used the original Talking Mats when I explored Kate’s communication with her, but you could do the same with Digital Talking Mats. Find out more about it here. 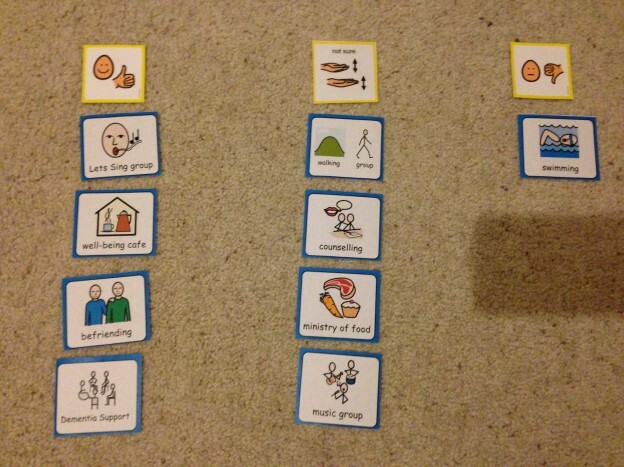 This entry was posted in AAC, Aphasia, App, Blog, Communication difficulties, Digital Talking Mats, Participation, Personalisation, Self directed care, Talking Mats principles and tagged AAC, App, Communication difficulties, Participation, Personalisation, Self directed care, Talking Mats on April 10, 2014 by Sally Boa.